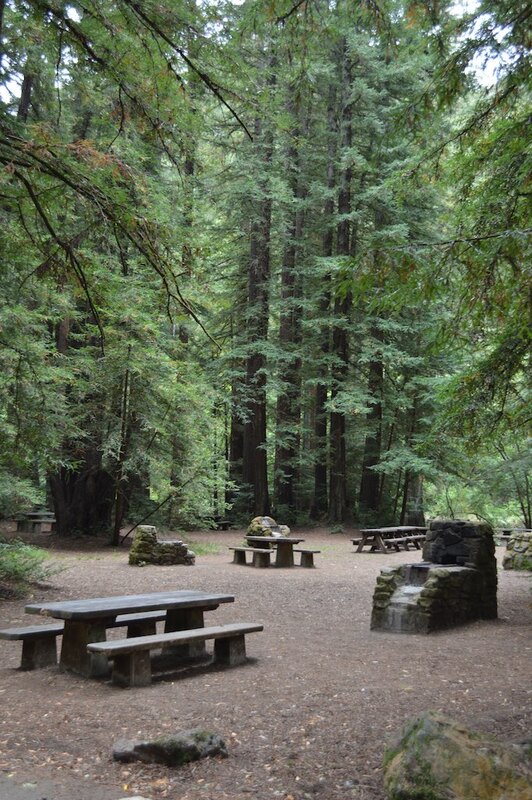 Samuel P. Taylor State Park is a great place to camp and picnic among redwoods. It also offers a network of fire roads and hiking, biking, and equestrian trails. The scenic, mostly paved Cross Marin Trail follows the historic North Pacific Coast Railroad right-of-way. Interpretive signs throughout the park help visitors learn about nature and imagine life in the mid-1800s, when Samuel P. Taylor built a paper mill here. If you have an hour, picnic among the redwoods beside Lagunitas Creek. If you have half a day, make a pilgrimage to some of Central California’s tallest trees by hiking to the old-growth grove along the 2.7-mile Pioneer Tree Trail loop. If you have a full day, hike up Devil’s Gulch to Barnabe Peak. Starting along a fern-lined creek, climb up through a mixed forest and open meadows to 1,466-foot Barnabe Peak. 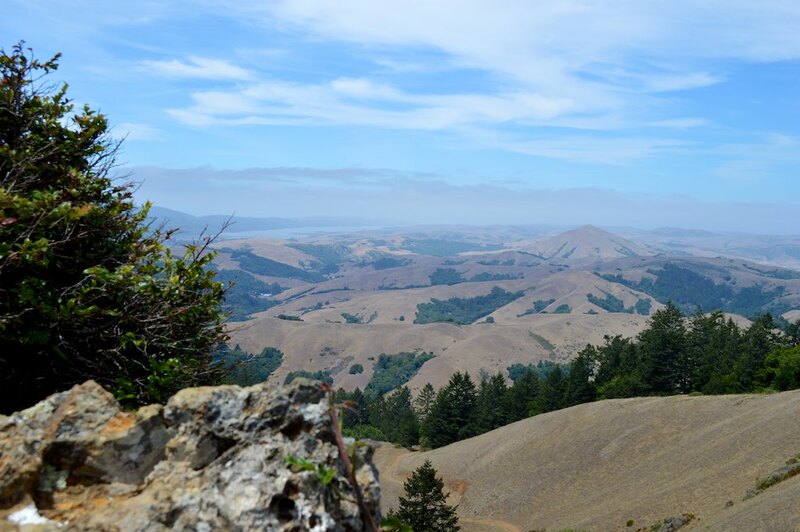 On clear days, the view includes Inverness Ridge, Bolinas Ridge, Tomales Bay, Mount Tamalpais, and sometimes even Mount Diablo. Samuel P. Taylor State Park’s wheelchair-accessible facilities include parking, campsites, restrooms, and showers in the Creekside and Orchard Hill loops, the main picnic area and day-use restrooms. Campsites 15, 21, 30, 37, 39, and 58 are reserved for visitors with disabilities. Two of the Madrone cabins are also wheelchair accessible. A valid DMV-issued handicapped placard/license plate with registration printout and ID are is required at check-in. The visitor with the disability must be present each night/day of the reservation/use period. 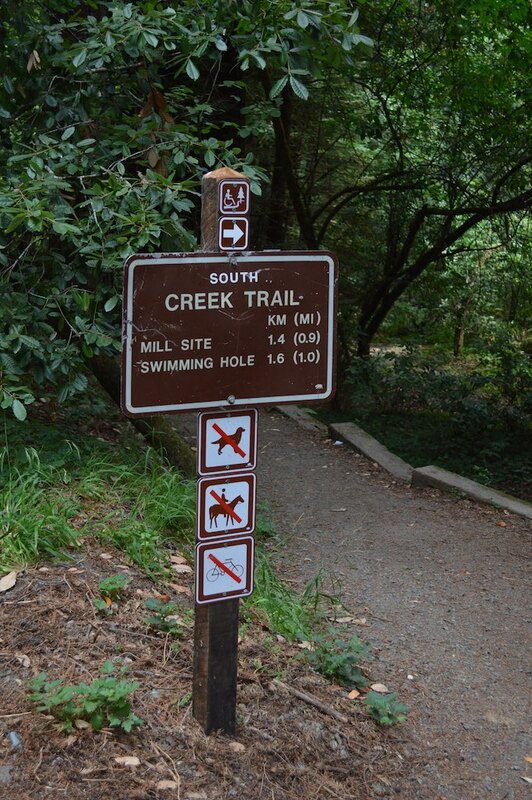 The new wheelchair-accessible South Creek Trail follows Lagunitas Creek for approximately 1.5 miles, complementing the 3 accessible miles of the Cross Marin Trail. Accessibility is continually improving in state parks. For updates, call 916-445-8949 or visit http://access.parks.ca.gov. Beginning near the entrance, the paved Cross Marin bike path runs about three miles through the park, following the old North Pacific Coast Railroad right-of-way. If you come in the rainy season, you could spot coho salmon or steelhead trout in Lagunitas Creek. Bring a camera—not a fishing pole; these threatened fish species must not be disturbed. To get to the Cross Marin Trail, follow the main park road across the creek. Turn either right or left to explore the trail in the park. Turn right to head through the park to the Golden Gate National Recreation Area. You can also access the trail at the south end of the park. Use the foot bridge to cross Lagunitas Creek next to Shafter Bridge. Bicycles are also allowed on park fire roads, but not single-track hiking trails. To plan your route, view the map in the park brochure. The park offers a communal first-come, first-served hike-and-bike campsite for up to eight people who backpack or pedal into the park. There’s little privacy and a few raccoons, but no need for reservations. To reserve a campsite or group picnic site, call 800-444-7275 or use the reservations link at the top of the park's home page. Click here for cabin reservations! Hike & Bike—First-come, first-served, if you hike or pedal into the park—maximum 8 persons. Devil’s Gulch Group Camp and Horse Camp—Reservable thru mid-August, then closed until the end of February. The main campground has about 60 single-family campsites with restrooms, hot showers, and piped drinking water. Some parking spaces can hold small trailers or RVs; none have hookups. 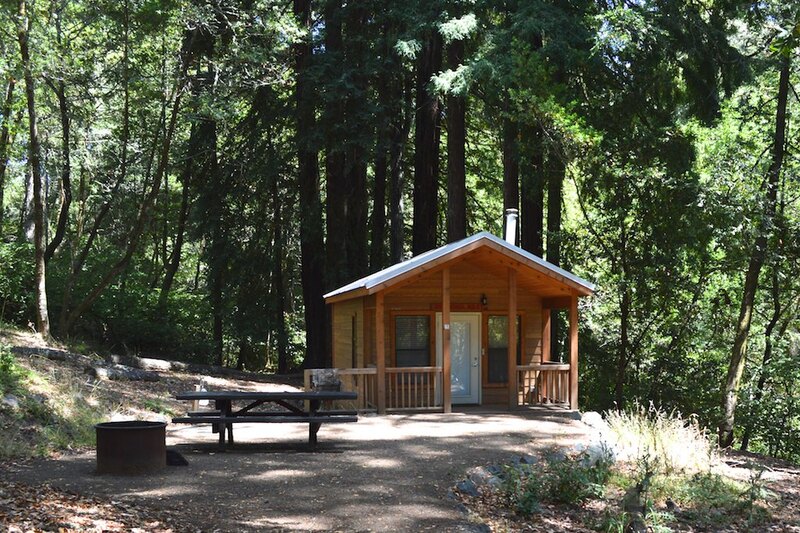 The Madrone Group Camp can be reserved for up to 50 people. Devil’s Gulch has three campsites. Two tent-only sites can accommodate up to 10 people. The larger, equestrian-use-only campsite has a corral, hitching racks, and water troughs; it can accommodate up to 20 people and 12 horses. This site is restricted for use by equestrians; therefore, horses must be present every night. Campgrounds are often full on weekends and every day during the summer months. The maximum occupancy for standard, single-family campsites is six persons of any age. All campsites have a picnic table, fire ring, and barbecue grill for charcoal. Campers should leave food items in a closed vehicle to prevent theft by raccoons and other park wildlife. Food lockers are provided for convenience only and are not meant to be critter-proof. Hammocks, clotheslines, and other weight-bearing structures are not permitted to be hung from trees; all trees and plants are protected. Reservations can be made from seven months to two days in advance. The reservation link's website will indicate if any campsites are not reserved for the current day by marking them with a “W” for walkup. Walkup sites are not sites you have to walk to, but rather are sites that may be available on a first-come, first-served basis. Note that sites 15, 21, 30, 37, 39, and 58 are only for visitors with disabilities. A valid DMV-issued handicapped placard/license plate with registration printout and photo ID are required at time of check-in to an accessible campsite. The visitor with the disability must be present each night/day of the reservation/use period. 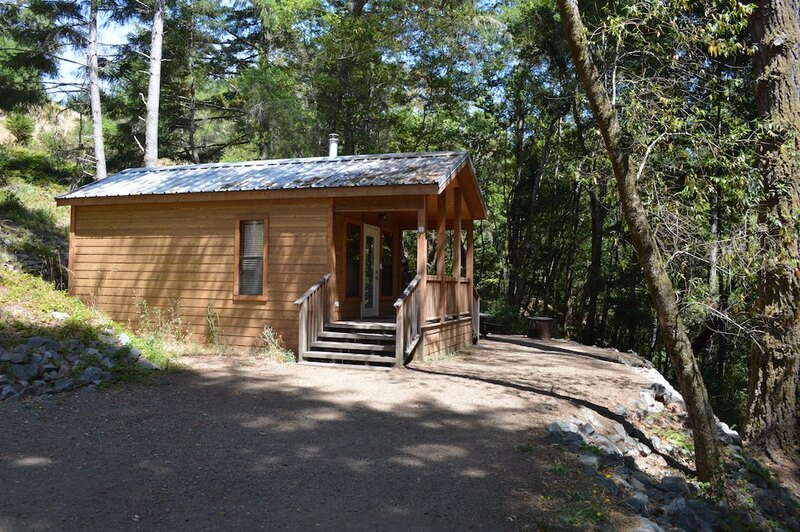 Four cozy cabins at Madrone may each be reserved for up to five people. One, “Coho Redd,” is reserved for people with disabilities. Each 12 x 20 square foot cabin has electric outlets, lighting, wood flooring, a covered porch, a small electric faux-wood-burning heater (not for cooking), and four platform bunk beds with camp-style mattresses. One lower bunk has a full-size mattress and the rest are twin size. Cabin occupancy is five persons maximum. Cabins can be locked. You will need to bring pots, pans, utensils, towels, flashlight, sleeping bags and/or linens. The cabins do not have bathrooms, but a separate restroom building with coin-operated hot showers is a short walk away. The Madrone area lies at the bottom of the grassy hills of Mount Barnabe. You'll enjoy the shade of the bay, oak, madrone, and redwood trees. Outside each cabin are a picnic table, fire ring, barbecue grill and water spigot. Parking is 100–300 feet away. You can load and unload belongings in closer short-term parking. • Check-in time begins at 3:00 p.m. and check out is 11:00 a.m. These times are strictly adhered to. We cannot accommodate early check-in or late check-out requests. • Parking for two licensed vehicles is included in the rental fee. One additional vehicle may be allowed for an additional cost of $8 per night. No RVs, trailers, or tents are permitted. • Only charcoal briquets are permitted in the barbecue grills. • Wood may be burned in the outdoor fire ring only. It can be purchased at the park. • A maximum of five persons are allowed in each cabin at all times. • Absolutely no open flames are permitted indoors, such as those from camp stoves, candles, or barbecues. • Smoking in the cabin or within 30 feet of the buildings is prohibited by law. Violation will result in forfeiture of the cleaning deposit. • Dogs and other pets are not allowed in or around the cabins. Please leave your pet at home. Taylor’s small trail network has variety— everything from a pleasant stroll among the redwoods along Lagunitas Creek to a steep climb up to 1,466-foot Barnabe Peak. For suggestions, see below. For the most current trail information or to report trail concerns, please call the park at 415-488-9897. Bill’s Trail is closed to improve recreational access for hikers, equestrians and mountain bikers. Access to Stairstep Falls will not be possible during this closure. Access to Barnabe Peak will continue to be available directly via Barnabe Fire Road or by Gravesite Trail to Barnabe Fire Road. North Creek Trail is not passable due to the washout of a portion of trail and a bridge. The trail can still be used to go from Madrone Group Camp to Camp Taylor. 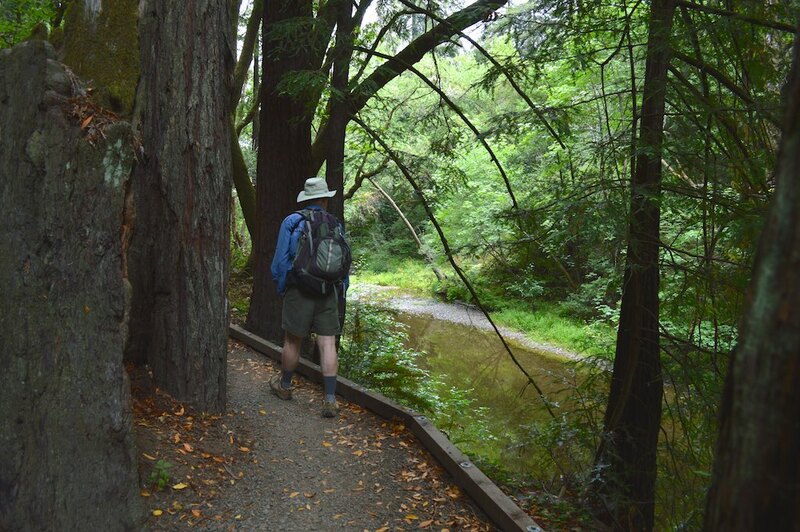 A charming trail that stays close to the shaded waters of Lagunitas Creek. The redwoods are lovely any time; after rains, look for spawning salmon; in winter and spring, wildflowers are at their best. At 1.5 miles, you’ll reach the rocky remains of Samuel P. Taylor’s old paper mill. You can turn around there—or proceed a quarter mile on the Cross Marin Trail to a bridge across the river—an excellent spot for taking photos and watching fish. To get there, follow the main park road across the creek. Turn right onto the Cross Marin Trail. In about a quarter mile, you’ll see the South Creek Trail sign on your right, just past the last campsite. The trail will wander toward the creek and back up to the Cross Marin Trail, which it utilizes to connect its unpaved segments. Trailhead: Camp Taylor entrance. 6 miles round trip, partly paved, elevation change 100 feet, wheelchair accessible. The Cross Marin Trail follows the route of the old North Pacific Coast Railroad, which once stretched 78 miles from Sausalito to Point Reyes, Tomales Bay, and Cazadero. Today the trail is popular with bicyclists and people with strollers or wheelchairs. Though not as close to nature as South Creek Trail, it’s scenic walking, rolling, or biking. To get there, follow the main park road across the creek. Turn right to explore the paved section of the trail. Turn left to try the shorter, unpaved section. This single-track trail gently climbs up a canyon through a small but impressive stand of old-growth redwoods. Next, the trail heads through a mixed forest to the trail’s namesake tree, which stands outside the main grove. Beware of abundant poison oak! The trail then curves back to the Cross Marin Trail. From there, turn left for an easy 0.5 miles back to the start. This hike is a good workout with lots to admire: A salmon stream, woodlands with redwood, oaks, buckeye, madrone, Douglas-fir, bay laurel, and California nutmeg interspersed with grassy meadows. Up top, you’ll be rewarded with sweeping views of Tomales Bay, Point Reyes, and Mount Tamalpais. On a clear day, you might even spot Mount Diablo, some fifty miles to the east. To get to the trailhead from Sir Francis Drake Boulevard, go past the Camp Taylor sign and pull off in a small parking area on the left side of the road. Cross the road and head up eerily dark Devil’s Gulch. Cross the Gulch at the bridge. Take the Gravesite and Barnabe trails to the top. On Gravesite, an unmarked spur trail on your right leads to the white picket fence protecting the final resting places of Samuel Penfield Taylor and his wife, Sarah Washington Irving Taylor. Take a map. Return by coming down the trails in reverse order. Horseback riders are welcome on dirt roads (hike/bike/horse) and multi-use trails (hike/bike/horse), as well as on some unpaved trails (hike & horse). 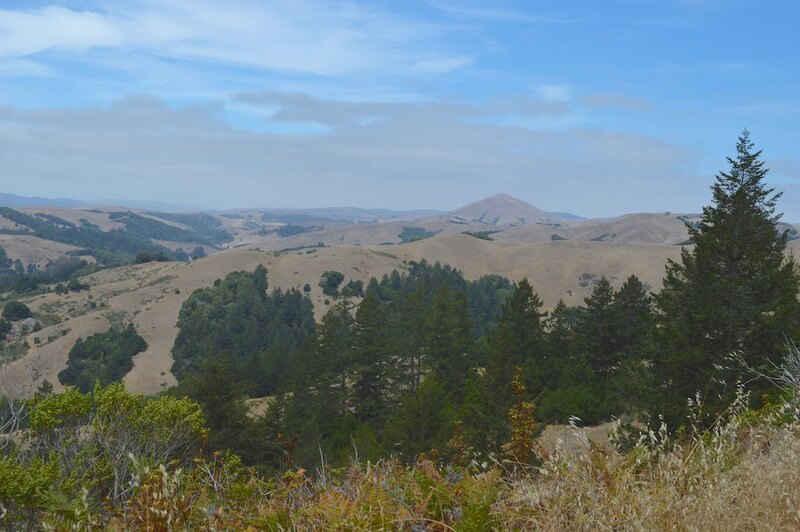 These include the Cross Marin Trail, Barnabe Road, Devil’s Gulch Road, and Ox Trail. For details, see the brochure map. Devil’s Gulch has one equestrian-use-only campsite with a corral, hitching racks, and water troughs. It can accommodate up to 12 horses and 20 people. Reserve up to six months ahead by calling (800) 444-7275 or using this link. From Memorial Day weekend through Labor Day, Samuel P. Taylor State Park offers interpretive programs to inform and entertain visitors of all ages. Activity details are posted throughout the park. Nature walks are suitable for all ages. Junior ranger programs are for visitors age 7 to 12. If you prefer activities centered around your own family or if you come in the off-season, you and your kids can work your way through the Adventure Guide together. Download the guide, or call 916-654-2249 to order a copy in English or Spanish. Before heading to the park, explore the online Redwoods Learning Center, set up by Save the Redwoods League. It offers fun, redwood-themed activities, classroom tools, and ways to get involved in redwood protection. Redwoods bingo, anyone? The park’s main picnic area, known as “Azalea” (for a hotel that used to be on the site), sits in a creekside grove of redwoods near the park entrance. Each site has a table and barbecue. Piped drinking water and restrooms are nearby. 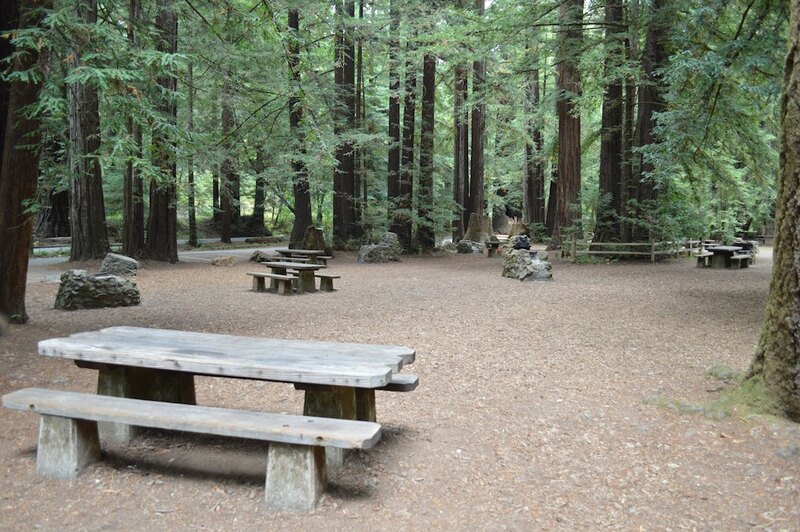 The reservable Redwood Grove and Irving group picnic areas hold groups of up to 80 and 30 people, respectively.